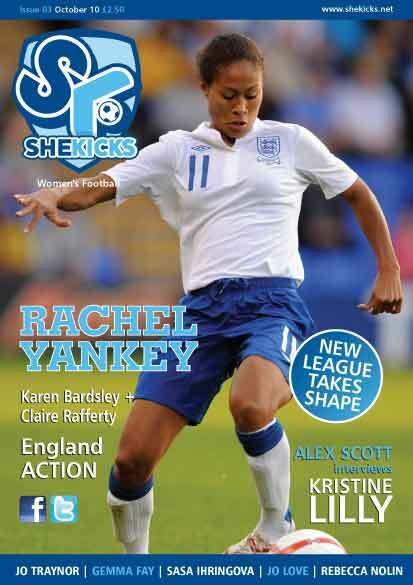 Issue 3 of She Kicks pays tribute to Arsenal and England winger Rachel Yankey who recently earned her 100th England cap. In a nod to players with super long and impressive careers we also succeeded in begging England full back Alex Scott to interview her Breakers’ team mate, U.S. WNT legend Kristine Lilly. We also catch up with England ‘keeper Karen Bardsley; Chelsea’s exciting left-sided prospect Claire Rafferty; Celtic and Scotland duo Jo Love and Gemma Fay; Liverpool’s Jo Traynor; England’s top female official Sasa Ihringova; Atlanta Beat’s English defender Rebecca Nolin and we check in with Sunderland’s Mick Mulhern and Barnet’s Tracey Kevins, both managing teams in the FAWPL. Plus we have news, info from Super League clubs, fitness, England action and poster, club pages, a silly quiz page and academy and tournament info too! Issue 3 is an A4, full colour, 52 page catalogue of women’s football loveliness.